1) or or O’Ferrall (Clarendon MSS., 4639, British Museum). Vert a lion ramp. or, armed and langued gu. Crest—A greyhound in full course ppr. 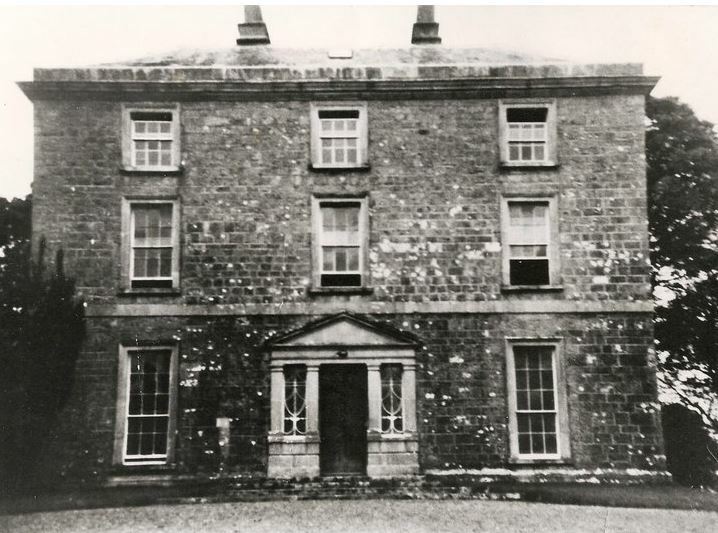 2) (Glin and Killindowde, co. Longford; allowed by Hawkins, Ulster, 1775, to Richard O’Farrell, of Havanna, in tbe West Indies, descended from O’Farrell, of Killindowde, a branch of O’Farrell, of Glin). Same Arms. Crest—A greyhound springing ar. collared gu. Motto—Cu reubha. 3) (Dalyston, co. Galway; exemplified to Charles Carroll, Esq., J.P., of Dalyston, maternally a descendant of O’Farrell, of Momyng and Bawn, co. Longford, of the Clanna Boy, upon his succeeding to the estates of his maternal uncle, the late Charles Farrell, Esq., M.D., of Dalyston, and assuming, by royal licence, 1855, the surname and arms of O’Farrell, in lieu of those of Carroll). Per fess or and vert a lion ramp. counterchanged, on a canton gu. an Irish harp of the first. Crest—On an Eastern crown or, a greyhound courant per pale ar. and sa. gorged with a collar gu. therefrom a broken chain of the last. Motto—Cu reubha. 4) O’Ferrall Buoy (Lords of Annaly, formerly Angliaile, co. Longford; descended from Fearghail, Chief of the Sept, who fell at tbe Battle of Clontarf, A.D. 1014). (Ballintobber, co. Longford; descended from O’Ferrall Buoy). (Mornin, co. Longford, and Conskeagh, co. Roscommon; Fun. Ent. Ulster’s Office, 1640, Edmond O’Ferrall,, of the latter, son of Irial O’Ferrall, of the former, who was son and heir of Faohny O’Ferrall, and grandson of Brian Ferrall, both of Mornin). Vert a lion ramp. or. Crest—On a ducal coronet or, a greyhound springing sa. Motto—Cu reubha (I have broken my hold). 5) (Tenelick, co. Longford; Fun. Ent. Ulster’s Office, 1620, Connall O’Ferral, of that place). Same Arms, quartering, 1st, az. a talbot pass. ar. collared and langued gu. ; 2nd, az. a griffin segreant ar. ; 3rd, ar. a lizard displ. vert. Same Crest and Motto. 6) O’Ferrall Bane (Bawne, co. Longford; descended from the same Sept as O’Ferrall, of Tenelick). Same Arms, Crest, and Motto, without the quarterings. 7) (Balyna, co. Kildare). Quarterly, 1st and 4th, vert a lion ramp. or, for O’Ferrall; 2nd and 3rd, vert a lion ramp. or, on a chief az. three mullets of the second, for O’More. Crest—On a ducal coronet or, a greyhound springing sa. 8) (Carmichael-Ferrall; exemplified, 1852, to Catherine Carmichael, of Sloane Street, Chelsea, Middlesex, widow of Major-Gen. Hugh Lyle Carmichael, and dau. and heir of John Ferrall, M.D., of Jervis Street, Dublin, on her assuming, by royal licence, the additional surname and arms of Ferrall, in compliance with her father’s will). Quarterly, 1st and 4th, vert a lion ramp. or, for Ferrall; 2nd and 3rd, ar. a fess wreathed gu. and az. in chief a trefoil vert for diff., for Carmichael. Crests—1st: Out of a ducal coronet or, a dexter hand gu., for Ferrall; 2nd: An arm embowed in armour grasping a broken lance all ppr. charged with a trefoil or, for Carmichael. 9) or O’Ferrall (Connaught, Ireland; the Princes of Annaly). Vert a lion ramp. or. Crest—On a ducal coronet a greyhound courant gorged with a collar, to which is affixed by a broken chain suspended over him, a regal crown all ppr. Motto—Cu reabtha. 10) or Ferrall (Dublin; certified by Hawkins, Ulster, 1707. to Richard Ferrall, of Dublin, eldest son of Richard Ferrall, Esq., of Ballenry, co. Longford, descended from William O’Ferrall, Bishop of Ardagh, 1486). Same Arms. Crest—A dexter hand appanmee gu. 11) (Dalyston, co. Galway; exemplified 5 March, 1855, to Charles Fabrell, Esq., son of John Cabroll, of Edgeworthstown, co. Longford, by Margaret, his wife, dau. of Charles Farrell, Esq., of Dalyston, on his taking, by royal licence, the name and arms of Farrell, in lieu of those of Carroll). Per fess or and vert a lion ramp. counterchanged, on a canton gu. an Irish harp of the field. Crest—On an eastern crown or, a greyhound courant per pale ar. and sa. gorged with a collar gu. therefrom a broken chain of the last. Motto—Cu reabtha. 12) (co. Warwick). Sa. three palets or. The surname of Farrell or O’Farrell means warrior or champion and the son, grandson or descendant of King Fearghal who was killed in the Battle of Clontarf in 1014. Fearghal’s grandfather was Angall who had established control over Annaly (Anghaile). All variations of the name Farrell derived from the Gaelic name Fhearghail (fhear = man and ghal = valor). The O prefix is a later form of the name and is a form of “Ui” meaning the grandsons or descendants of Fhearghail. The O’Farrell surname can be found almost everywhere in present day Ireland especially in County Longford where it comes in as a close second only to the surname of O’Reilly. (Celtic) Warrior, Champion [Old Irish Ferghal—fer, man + the aspirated form of gab valour] Of course, the later form was O’Fearghail = Grandson or Descendant of Fearghal. From the 11th to the 17th century the Farrell Clan maintained control over the region Annaly. It was only interrupted by the English invasions of the 12th and 13th centuries. Although after invasions the Farrell Clan regained total control and they had divided it into two seperate domains. North Annaly was ruled by the White O’Farrell and the South Annaly was ruled by the Yellow O’Farrell. Many members of the O’Farrell clan served in the Spanish Army in an Irish Regiment during the Eighty Years War in the 1500’s. The first recorded spelling of the family name is shown to be that of Father Richard O’Farrell, which was dated c1615-1663, Annaly, County Longford, during the reign of King James 1 of England and V1 of Scotland, 1603-1625. Charles Richard John O’Farrell of Dalyston, County, Galway, J.P., High Sheriff 1906, b. 22 Sept. 1874. Succeeded his father 1892. Charles Farrell, of Dalyston, and assumed in consequence by Royal Licence 21 Feb. 1855 the surname and arms of Farrell instead of his patronymic CARROLL, and subsequently 28 Jan 1857 by Royal Licence, resumed the name of O’Farrell in lieu of that of Farrell; married 20 Jan. 1870, Kate Mary Constance, only daughter of James William MacLoghlin of Ballyglass, County, Westmeath, and had issue 1) Charles Richard John, now of Dalyston. 2) Richard 3) Henry 4) Frederick 5) Kathleen Maud Mary 6) Ethel married Claude W.R. Hutchinson of Eggleston Hall, Durham. Mr. C.G. O’Farrell (who was son of John Carroll, of Edgeworthstown, County, Longford, by Margaret his wife, daughter of James Farrell of Minard died 1892 and was succeeded by his son. Arms – Per fesse or and vert a lion rampant counterchanged on a canton gu. an Irish harp of the first. Crest – On an Eastern crown or, a greyhound courant per pale arg. and sa., gorged with a collar, therefrom a broken chain, both gu. Edward Gerald More-O’Ferrall, of Balyna, County, Kildare and Lisard, County, Longford, J.P. and D.L. High Sheriff 1882, born 1846; married 1871, Juliana Margaret, daughter of Henry Lambert, M.P. of Camagh, County, Wexford, and has, with other issue, 1) John born 1872 2) Gerald More (Balyna, Moyvalley, R.S.O. ), married 23 Oct 1907, Geraldine Mary, eldest daughter of late Lord Maurice FitzGerald and has issue, Edward George born 5 Aug. 1908. 3) Ellen Letitia, married 9 Jan 1904, Charles Hugh O’Conor, 3rd son of Right Hon. O’Conor Don, P.C. Lineage ~ Charles O’More, of Balyna, died 1601, leaving (by Margaret Scurlock his wife) two sons and a daughter 1) Roger, Col. Confederated Catholics 1646, married Jane daughter of Sir Patrick Barnewall, Knt of Turvey, and had issue a) Charles, Col. in the Army, killed Aughrim 12 July 1691, died without issue. b) Anne, wife of Patrick Sarsfield of Lucan, and mother of Patrick, Earl of Lucan c) Eleanor, wife of Daniel MacMoragh Kavanagh. d) Mary wife of Tirogh O’Neill e) Elizabeth wife of Christopher Bealing. 2) Lewis, of whose line we treat 3) Margaret married Thomas Plunkett of Clonebraney. The 2nd son, Lewis More (Col.) one of the Confederated Catholics in 1646, married Mary daughter of Philip MacHugh O’Reilly and was father of Anthony More of Balyna, who married Anne, daughter of Alexander Hope, of Mullingar and had (with a daughter, Mary wife of Capt. Conor O’Reilly) two son, 1) Lewis his heir 2) Roger, who will (dated 1 March 1746) was proved 9 Jan. 1748. He married Elinor, daughter of William Wright and had issue, 1) Anthony O’More, Gen in the Spanish service. 2) May, wife of Robert Daly of Caulfield 3) Mary wife of Packington Edgeworth of Longwood. The elder son Lewis More of Balyna married Alicia daughter of Con O’Neill and had (with a daughter, Mary, maid of Honour to the Queen of Spain, married ____ Ward of Madrid) a son and heir, James More, of Balyna, whose will bears date 13 Dec 1778, by Mary, his wife (died 30 July 1771) daughter of Ambrose Madden of Derryhoran, he left an only daughter and heir Letitia More who married 19 April 1751, Richard O’Ferrall (whose sister Catherine married George Lattin of Morristown) only son of Ambrose O’Ferrall by Jane Dillon his wife and dying 1778 (her husband survived till 1790), left (with several daughters Mrs. Bougler, Mrs. Morris, Mrs. Taylor, Mrs. Pallas of Grouse Hall, County, Cavan, and Mrs. Nugent of Killasona, County, Longford) three sons, 1) Ambrose his heir 2) James, Major-General in the Austrian service died 1828 aged 75. 3) Charles Col in the Sardinian service died 1831 married Margaret daughter of John Whyte of Leixlip. The eldest son, Ambrose O’Ferrall of Balyna married 1796 Anne only child of John Bagot of Castle Bagot, County, Dublin, by Anne his 1st wife only daughter and heir of W. Walsh of Kilmurry County Meath by Elizabeth Nangle his wife, and by her (who died 1810) had issue, 1) Richard More (Right Hon. ), of Balyna House 2) John Lewis More, of Lissard, County, Longford, and Granite Hall, County, Dublin, J.P. D.L, M.A., Barrister at Law, Commissioner of Metropolitan Police, Dublin married 1836, Clare daughter of Thomas Seagrave of Cabra, County, Dublin and died 21 Jan 1881, leaving a) Edward Gerald More, of Lissard and Balyna, to which latter estate he succeeded on the death of his cousin b) Mary c) Maria d) Ellen married 1879, the Right Hon. O’Conor Don, P.C. 3) James More died unmarried 4) Robert More (Rev.) died 1834. 5) Edward More of Kildangan, County, Kildare, High Sheriff County Kildare 1856-7 married 1849, Susan only child of Dominick O’Reilly, of Kildangan Castle, County, Kildare, and by her (who died 1854) left at his decease, 1875 an only son, Domonic More O’Ferrall of Kildangan, High Sheriff County, Kildare, J.P. and D.L. 1879, born 1854; married 1898, Annie daughter of Col. Francis MacDonnell, C.B. of Plas Newydd, County Monmouth and has issue, i) Roderic Charles born 25 July 1903 ii) Francis Ambrose born 15 Aug 1904 iii) Edward Roger born 30 May 1906 6) Mary Ann died unmarried 7) Letitia a nun 8) Louisa died unmarried 9) Catherine died 1886 10) Rose Anna (dec.) married Thomas Errington of Clintz, County York. Mr. O’Ferrall married 2ndly 1811, Margaret youngest daughter of Francis Dunne, of Brittas, Queens Co., which lady died 1826. He died 1835, aged 83 and was succeeded by his eldest son, Right Hon. Richard More O’Ferrall, of Balyna County Kildare, P.C., J.P. and D.L., born 1797; married 28 Sept. 1839, Hon. Matilda Southwell 2nd daughter and co-heir of Thomas Anthony, 3rd Viscount Southwell, K.P. and by her (who died 25 May 1882) had issue, 1) Ambrose, late of Balyna, County Westmeath. 2) Maria Anne married 19 July 1860 Sir Walter Nugent, Bart. of Donore. Mr. More-O’Ferrall, who was M.P. for County, Kildare 1830-47 and for County Longford 1859-65, was appointed a Lord of the Treasury 1835, Secretary to the Admiralty 1839, and Secretary to the Treasury 1841. From 1847 to 1851 he held the office of Governor of Malta. He died 27 Oct 1880. he was succeeded by his son, Ambrose More-O’Ferrall of Balyna, County, Kildare, J.P. and V.L. High Sheriff 1876, and J.P. County Carlow, High Sheriff 1887, born 26 Sept. 1846; married 24 Oct 1872, Jessie Frances, daughter of Patrick Robert Gordon-Canning of Hartpury Court, County, Gloucester. He died 16 April 1911 having had issue, 1) Mabel born 1873 married 1896 Major E.J.C. Dease eld. son of Edmund Gerald Dease, D.L. of Rath 2) Violet born 1874 3) Alice born 1880 married 1907 Alexander Lattin Mansfield, son of George Mansfield of Morristown, Lattin and has issue. He was succeeded by his cousin as seen above. Arms – Quarterly; 1st and 4th vert, a lion rampant or (O’Ferrall); 2nd and 3rd vert, a lion rampant in chief three mullets or (O’More). Crests – On a ducal coronet or, a greyhound springing sable (O’Ferrall). 2. A dexter hand couped gules (O’More). Motto – Cu reu bhaid. By 1014: Fergal’s Grandfather Angall established control over Anghaile. 1014: Fergal of Conmaicne was killed during the Battle of Clontarf. It is from this man that the Farrell clan claims their descent. 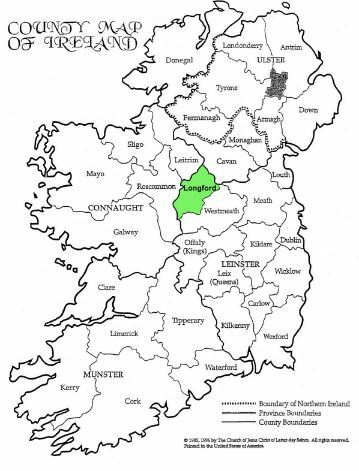 1262: The English of Meath pillage the lands of Lord of Annaly GiUa O’Farrell (the Just), causing him to take revenge by slaying many and destroying land in County Meath. 1316: The O’Farrell’s fought at the Second Battle of Athenry and were defeated by the English. They fought in support of Edward the Bruce’s Irish Campaign. Four prominent O’Farrells were recorded as dead. 1323: A large English army under Lord Bermingham attempted to attack the O’Farrells, but were repulsed and slain at the command of Donnell O’Farrell. 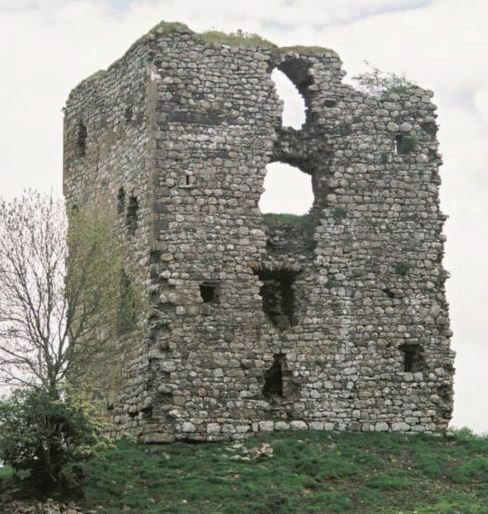 1329: The sons of John O’Farrell and a group of Meath English lured and murdered the Earl of Breifne at a house in Fore. Between 1347 and 1583: No fewer than seven O’Farrells served as Bishop of Ardagh and Clonmacnoise. 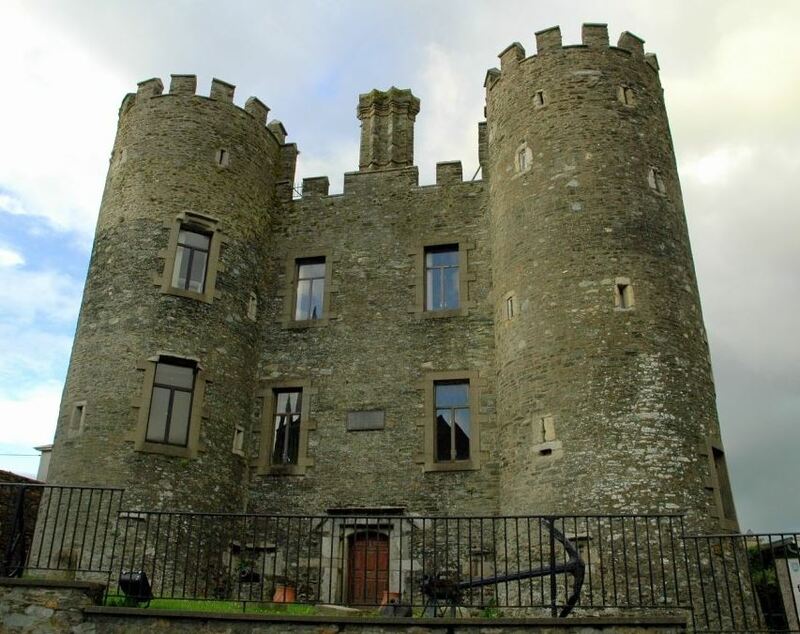 1452: The Chief O’Farrell clashed briefly with the Earl of Ormond, Lord Lieutenant of Ireland, over the imprisonment of Lord Bermingham’s son by the O’Reilly’s of East Breifne. O’Farrell buys Ormond off, and the Lord Lieutenant leaves to pursue O’Reilly. 1464: John O’Farrell and Redmond O’Farrell of the Annaly Lords died of bubonic plague along with members of their families. 1471: A battle between the O’Reilly’s and the O’Farrell’s took place at Clankee in which the O’Reilly commander was killed and the Chief O’Farrell was taken prisoner. 1475: A number of O’Farrells were banished to the English of Meath for killing a member of the clan. 1504: Chief O’Farrell (along with most other Irish chiefs) joined forces with the Lord Deputy, Gearóid FitzGerald, and they formed a very large army. This English/Gaelic army marched on Munster and were victorious over the O’Briens at the Battle of Knockdoe, one of the largest battles ever witnessed in Ireland. 1565: The Annaly O’Farrell’s repeatedly clashed with the new Lord Deputy to Ireland, Sir Henry Sidney, who planned to shire the county. 1618: The Farrell’s of Longford are finally deposed as Lords of Annaly by King James I, losing their lands and privileges forever. “They were deprived of their estates without any compensation whatsoever, or any means of subsistence assigned them” (Annals of the Four Masters). 1620: The first written record of a Farrell in the English language was by Father Richard O’Farrell, who was a priest in Annaly, Longford. He was a member of the Irish Catholic Confederacy, and later witnessed and wrote about conflicts on the European Continent. 1649: At the First Siege of Waterford, Oliver Cromwell battled with General Richard Farrell, who arrived in order to defend the city. 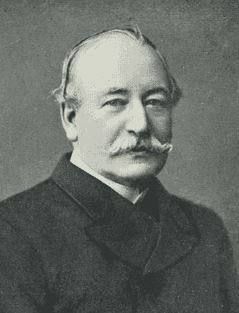 Farrell, deputy to Owen Roe O’Neill, was victorious. 1649: In Wexford, Captain Daniel Farrell recaptured Enniscorthy Castle from the New Model Army. 1650: Francis Fergus O’Farrell was born in County Longford. He moved to the Netherlands, married a local girl, and had six children. Eventually, he served in the army of William of Orange and saw action in England and Ireland, fighting for the Protestants. 1652: After Waterford, General Richard Farrell appeared again in Irish history, this time defending Galway with Thomas Preston, 1st Viscount Tara against the New Model Army. Here the English Parliamentarians were victorious. 1657: The remnants of the O’Farrell clan, known as the Wild Geese, were in the service of the French Army, and commanded an access route to Brussels during the Franco-Spanish War. 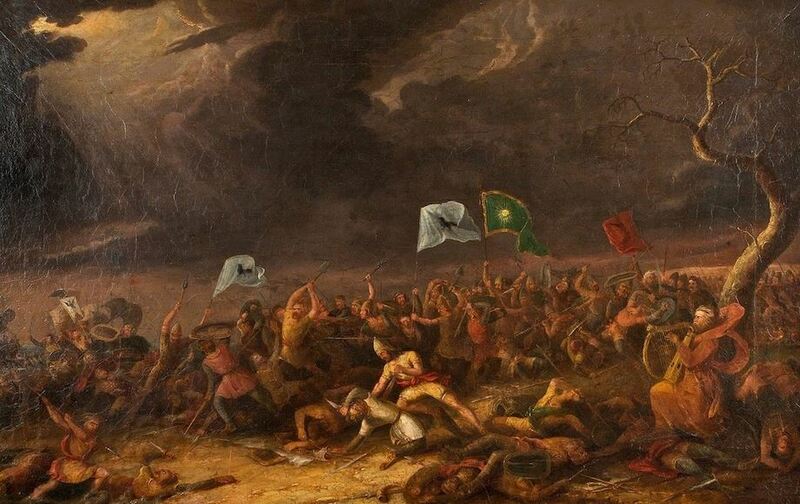 However, at the behest of exiled Charles II of England, they switched sides and allowed the Spanish to pass on the road and attack Brussels from Flanders. 1662: The O’Farrell clan, on the orders of the recently reinstated King Charles II, was commissioned to Tangier in North Africa. 381 O’Farrells make up the bulk of the Irish contingent, which was half of the Tangier Regiment, and sailed for Africa. 1691: Cheadagh O’Ferrall of Annaly, Longford was killed at the Battle of the Boyne, Meath. Cheadaigh’s three sons were recorded as fleeing to fight in French Brigades, with some settling in Picardy, France. 1709: Roger O’Ferrall authored a work entitled “Linea Antiqua, or, A Genealogical, Chronological, and Historical Account of the Gathelian, Melesian, Scottish or Irish People, or Nation, from the Beginning of time, to this Year of Our Lord 1709”, which collected together many genealogical pedigrees of the Gaels. It was later transcribed by Sir William Betham and copied by John O’Hart in his Irish Pedigrees. The document is held by the Genealogical Office at the National Library of Ireland. Cou rebu. I have broken my hold. Cor et mantis concordant. Sly heart and my hand are in concord. Cu re bu, sometimes Cu reab ha. The hound broken loose. Spes mea Deus. God is my hope. Farrell to Skeffixgtox, William Charles, of Skeffiiigtou, co. Leic. (Bart. ), 13 June 1772, Vol. XII, fol. 197. Henry Farrell, the author of the Hollywood horror novel What Ever Happened to Baby Jane? Herman D. Farrell Jr. (1932-2018), New York politician.